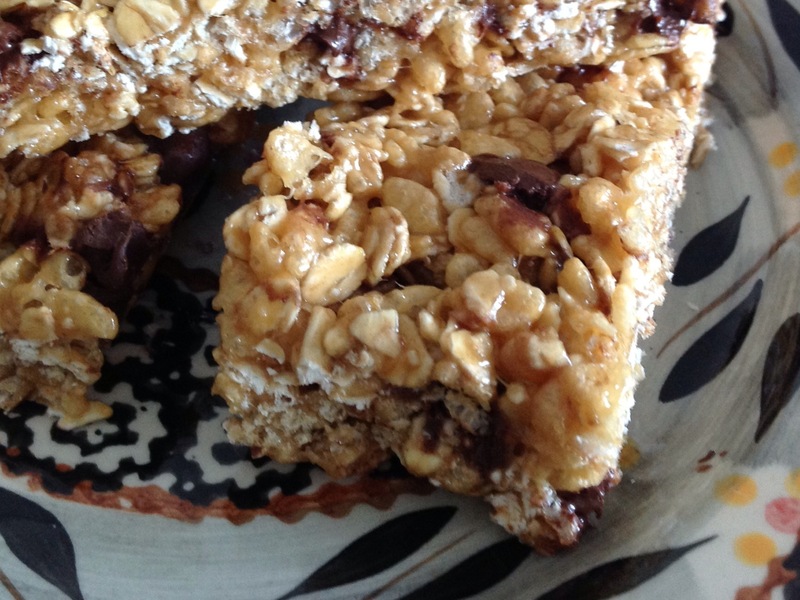 Making your own granola bars at home can certainly be more nutritious for your family and is definitely a money saving idea. A box of granola bars can range in price from a moderate $2 up to as much as $7, which is really quite expensive. Often, one can only guess at the ingredients that are included in the nutrition facts label. Ingredient names that I can’t recognize or pronounce are always a red flag for me. While this recipe isn’t the most nutritious of the bunch in my recipe box, it certainly is easy to make and I like the fact that it’s a no-bake recipe that can be made during the late summer months when the air conditioner shouldn’t have to compete with a hot oven. I often add nuts, seeds and dried berries for added texture, nutrition, and flavor. I wrap the cooled and cut bars in plastic wrap so that they stay fresh and are easily packed for travel. This is a great “kids in the kitchen” recipe. Spray a 13×9″ baking dish with non-stick cooking spray. Combine the first 3 ingredients in a large bowl; set aside. Bring the brown sugar and syrup (or honey) to a boil in a small saucepan over medium-high heat, stirring constantly; remove from heat. Stir in peanut butter and vanilla until blended. Pour peanut butter mixture over cereal mixture, stirring until coated; let stand 10 minutes to cool slightly. Stir in the chocolate chips. Press mixture into prepared pan; cool completely. Cut into bars. Wrap individually in plastic wrap to preserve freshness. Thanks for sharing my post and for visiting my blog!